Science is no quiet life. Imagination, creativity, ambition, and conflict are as vital and abundant in science as in artistic endeavors. 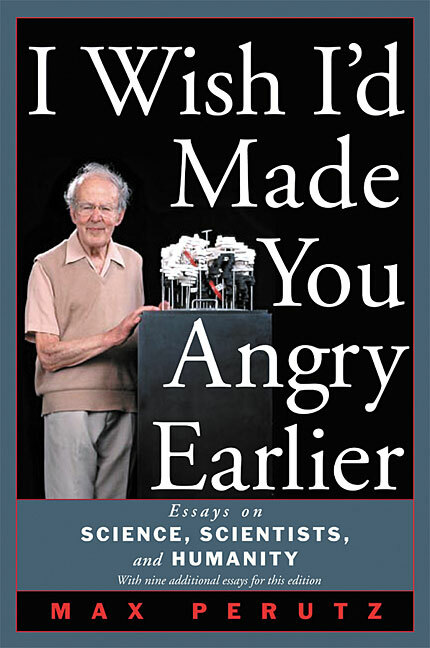 In this collection of essays, the Nobel Prizewinning protein chemist Max Perutz writes about the pursuit of scientific knowledge, which he sees as an enterprise providing not just new facts but cause for reflection and revelation, as in a poem or painting. Max Perutz's essays explore a remarkable range of scientific topics with the lucidity and precision Perutz brought to his own pioneering work in protein crystallography. He has been hailed as an author who "makes difficult subjects intelligible and writes with the warmth, humanity, and broad culture which has always characterized the great men of science." Of his previous collection of essays, a reviewer said "They turn the world of science and medicine into a marvelous land of adventure which I was thrilled to explore in the company of this wise and human [writer]." Readers of this volume can journey to the same land, with the same delight. Max Perutz (19142002) was a brilliant scientist, a visionary of molecular biology, and a writer of elegant essays infused with humanity and wisdom. This expanded paperback edition of his very successful book I Wish I'd Made You Angry Earlier contains nine additional essays, and a warmly evocative portrait of Max by his friend and professional colleague Sir John Meurig Thomas. The original hardcover edition of this book was co-published with Oxford University Press. A paperback edition is also available from Oxford University Press. The expanded paperback edition is only available from Cold Spring Harbor Laboratory Press. Friend or Foe of Mankind? Why Did the Germans Not Make the Bomb? By What Right Do We Invoke Human Rights? Swords into Ploughshares: Does Nuclear Energy Endanger Us? This is a wholly captivating book; it has warmth, wit and style, and not a dull sentence. I urge you to read, enjoy and learn." "The essays are beautifully written, with flashes of wit and humor. Many of the essays were written for the New York Review of Books; anyone addicted to that journal, as I am, will at once get a feel for the style of these essays. I read this as a bedtime book, so I dipped into it at random. When I finally found that there was no more to read, I felt quite disappointed  no more chocolates in the box!" According to Nobel Laureate Peter Medawar (physiology or medicine, 1960), one of the many scientists profiled in this book, science at all levels of endeavour is a passionate enterprise and the pursuit of natural knowledge a sortie into the unknown. Perutz's book, which we heartily recommend to scientist and nonscientist alike, will convince its readers of the truth of this statement."